We were away for a few days, and now we’re back. I love coming home! I’m such a homebody it’s just silly, I always have been. (It’s, like, totally cause I’m a cancer, man, so it’s in the stars.) In all honesty, I love being home. I love the idea of being a wild rambler. I love songs about rootless adventurers. I like going away, but I prefer coming back. As we get within an hour of our house, and the trees and the sky start to take on their exact perfect familiar size and spaciousness, I can feel my body relax and my spirits lift. Silly, I know, but there it is! I love my town: tiny, eccentric, imperfect, but so beautiful and full of good will. I was speaking to a friend the other day, who lives a block away, and I nearly laughed when he said he doesn’t want to leave the area. He really never even wants to leave our town. He just has no desire to venture beyond the ‘ville. Why did I nearly laugh? Because I know exactly what he means!! I love our house. It’s old, it’s falling apart, it smells like wet plaster, and that same plaster is crumbling off the walls, we have a large non-paying-tenant population of spiders (I like our spiders!). We have two little boys, so no matter how much I clean, the house is sticky and messy, and we have angry pee-spirits that live behind the toilets. But I love it all, right down to the little smudgy hand prints running along the walls at boy-height. I like walking home from my stupid job. I like having no plans, spending time with David and the boys, inventing small adventures. And, of course, I like cooking. For Robert Frost, home was the place they had to take you in. For Tom Waits, home is wherever he lays his head. For me, home is where I make meals for my family. If you can bring family and friends together around a table, and share a meal, and talk about all the things that have been racing around in your heads during the day. Well, then you’re home! My wise friend Benjamin Franklin once said, “A house is not a home unless it contains food and fire for the mind as well as the body.” And I’d add that a house is not a home if it’s not ringing with good music, so here’s a short playlist of songs about home. Do you know of any good songs about home that I should add? Before we left for a few days, I made a meal with tomato sauce and pesto sauce. The night before we left, I was going to make a galette with a walnut crust. At the last moment I surprised everybody (keep em guessing!) by making walnut Isaac crackers, and making a dip to go with it which involved puréeing white beans with each kind of sauce, and then swirling them together. (I still plan to make a galette with a walnut crust, so act surprised!) The dip couldn’t be any easier, and it’s a good thing to make if you’ve been baking different kinds of pizzas, and have some leftover sauce. The crackers go together in a breeze, as well. 1 can of white beans, rinsed, drained and divided in half. Purée half with 3 T of pesto sauce. And half with about 4 tablespoons of simple tomato sauce, with plenty of smoked paprika in it. You might need to add a few tablespoons of water to the pesto half, if you make thick pesto. Spread the dips side-by-side in a shallow bowl, and run a knife in circles from one to the other to make a pretty pattern. In a medium-sized bowl, combine the flour, walnuts salt and pepper. Grate in the frozen butter, and mix with a fork till you have coarse crumbs. Add ice water (less than 1/2 cup) till you have a workable dough. Knead for about a minute to be sure the butter is well-incorporated, and then wrap in foil or plastic and chill for at least half an hour. When you’re ready to bake, preheat the oven to 400. Lightly butter two cookie sheets. Break the ball of dough in half, and roll each half into an oblong about 1/8 inch thick. Move the rolled dough to the baking sheet, and then cut through it with a pizza cutter to make squares or diamonds. Sprinkle coarse salt and grind pepper on the top. Bake for about 15 minutes, till the crackers are brown on the edges. Let cool and then serve. 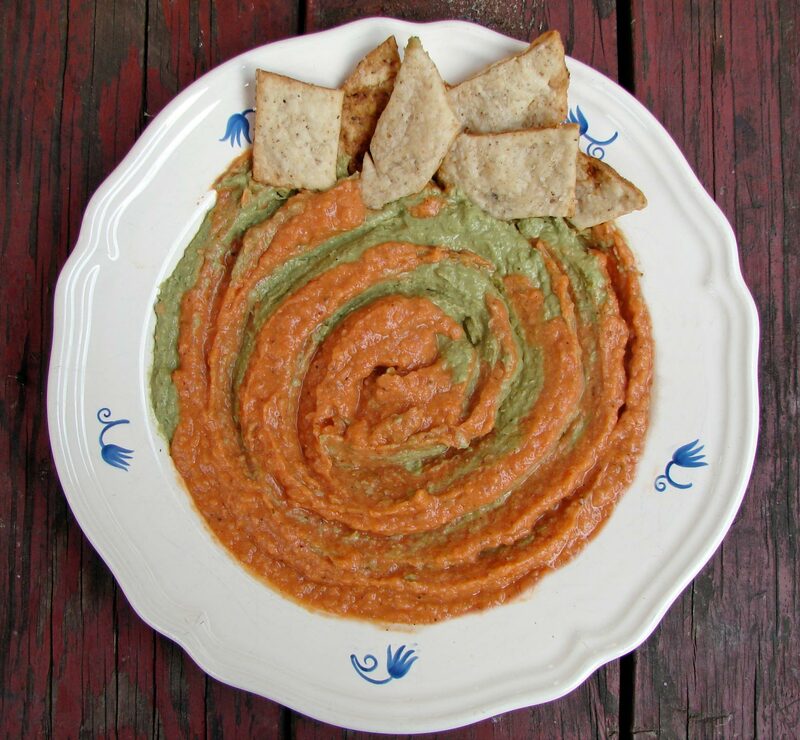 This entry was posted in recipe, Uncategorized and tagged pesto dip, tomato white bean dip, walnut crackers, white bean dip by Claire. Bookmark the permalink. The house I live in comes to mind, by Paul Robeson. Well! Just listening now. Wonderful suggestion. It’s been added to the list. Thanks! White bean dip is classic! Super easy and obviously very tasty besides. I love the idea of using two different flavors. Aaarrghh! My computer is so silly, lately. I think it’s hot! I replied to this, and now I’m afraid to post another reply because it will show up twice. Basically I said thank you for your kind comment, and I’m always glad to see a comment from you. I’m laughing, too. Lovely post about Home. I share you feelings. I never wipe the smudges off the wall that Ming made after his meals. His ritual was to rub his boogers on the wall. Now he is gone but his marks remain. Sisotowbell Lane by Joni Mitchell. Love that you use a lot of walnuts in your recipes. And sage. Both may help menopausal girls, like me. I think in my dreams home is where I grew up in Highland Park. I dream about my grandmother’s house, too, and about a house that doesn’t really exist but is usually tunnelly and expansive. Your home is something of an ideal! It’s funny that walnuts and sage are both good for you, because they’re so good together! Good to know! I’ll add your songs to the list as soon as we get the boys to sleep!